The young cancer survivors often suffer from depression and have a hard time finding their place in society. The first study made in Romania on the needs of the people in this category reflects this situation. Over 200 young people participated in Cluj-Napoca at the first national seminar on long-term effects of cancer. The attention and fertility issues or the fear of relapse were some of the topics discussed at the meeting of cancer survivors and medical specialists. The young people who attended also helped by participating in a study whereby the specialists could better understand the profile and needs of someone who survived cancer. The results also show that 20 percent of those who defeated the disease still suffer from chronic pain and experience difficulties in learning, while nearly 60 percent experience emotional difficulties and some of them even depression. 19 percent of those aged over 18 do not work and do not study and 16 percent face discrimination in the workplace. 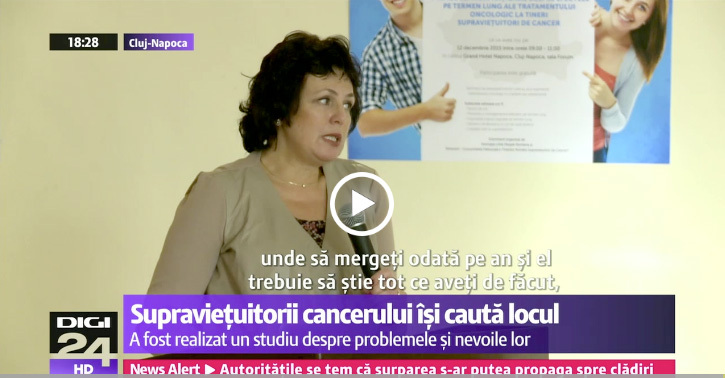 Rodica Cosnarovici, Head of Pediatric Oncology Department in the Cluj Oncology Institute: “I think the most common problems that they face are psychological and reintegration problems“. The doctors suggested that the Ministry of Health could also come to their aid, by developing a national pediatric oncology program at a national level.